New iPod Shuffle! Flash iPod finally introduced! 512 Mb and 1 Gigabyte capacity, US$ 99,95 and US$ 149,95 each. 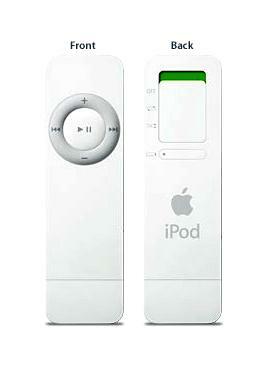 A cool design (obviously), a simple switch on the back, iTunes compatibility and a front "wheel-like" control pad that does almost everything. Why 'shuffle'? Apple pushes on the 'life is random' motto: the switch allows for a 'random play' and 'forget my playlist'!